Former Grete as Qajq W enroute to IJmuiden. The former Elbe ferry "Grete" has been refurbished at the Fiskerstrand Yard. The ship has been renamed "Qajaq W" now and registered under the flag of St. Vincent und Grenadines. 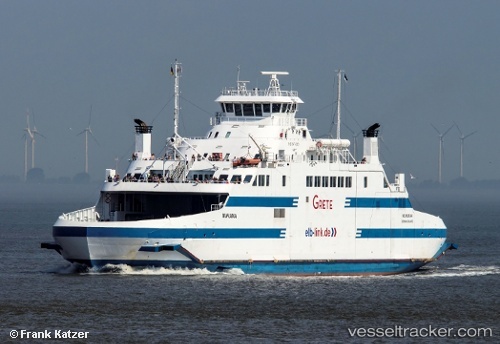 It left Norwegian waters and was expected in IJmuiden on Dec 24 at 7 a.m.
Two modern ferries will be servicing the Labrador coast in March of 2019, after the provincial government signed a new multiyear, $362-million ferry deal with Labrador's Woodward Group. The "Grete" and "Hiimuaa" are ice-class 1A ships built for northern climates, increasing capacities along the Labrador coast and will replacing the 47-year-old "Astron" and the 48-year-old "Apollo". The "Grete" will service the North Coast while the "Hiiumaa" will service the Strait of Belle Isle. Both vessels, which will be renamed before they enter service, are both fully accessible for persons with disabilities, as well both will have heated kennel areas for pet transport. On the Strait of Bell Isle run, the "Hiiumaa"'s passenger capacity will be 300 people, with two vehicle decks for 120 vehicles, and eight tractor trailers — up from 240 passengers, 80 vehicles and six tractor trailers with the "Apollo". For the north coast, the "Grete"'s passenger capacity will be 140 people, with overnight accommodations for 80, including two wheelchair accessible cabins, a capacity for a minimum of 20 vehicles, and 125 cargo units of freight — up from 131 passengers, no vehicle capacity and 110 cargo units currently with the "Northern Ranger" and "Astron". The turnaround time for the north coast run will be seven days with the new vessel — as opposed to 14 today. The "Grete" has got the new homeport Majuro while still being berthed in Wewelsfleth. On Sep 6 the ship was due to sail to the Fiskerstrand Verft in Aalesund to be prepared for a new service for the Labrador Marine on the route Blanc Sablon - St. Barbe.